Featuring your favorite chefs and cookbooks authors, The China Study All-Star Collection includes foods from Happy Herbivore chef Lindsay S. Nixon; Del Sroufe, author of the New York Times bestseller Forks Over Knives Cookbook; Laura Theodore, host of PBS' Jazzy Vegetarian; and pioneering researcher Dr. John McDougall, which all follow the nutrition standards set forth by The China Study. Even better, with delectable dishes such as Dreena Burton's Sneaky Chickpea Burgers, Heather Crosby's Peppermint Chocolate Chunk Ice Cream, Christy Morgan's Fiesta Quinoa Salad and Christina Ross's Daikon Mushroom Fettuccine, this collection of recipes has you covered for any occasion or craving. 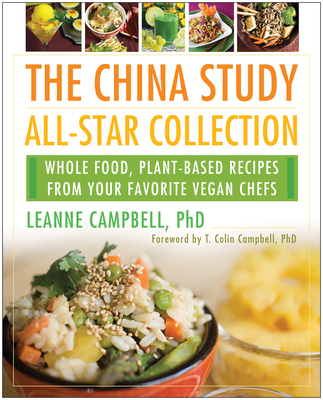 With an introduction from The China Study co-author Dr. T. Colin Campbell, The China Study All-Star Collection is the ultimate plant-based cookbook for healthful, savory eating.